For years I was looking forward to do some volunteer work but never found the time or the right place. I knew that I wanted it to be on the fields of education and women empowerment. I learnt about Laia Foundation through a friend (with whom I came to India the first time). Laia Foundation projects seemed very interesting and I immediately got in touch with them to apply for a volunteer opportunity. 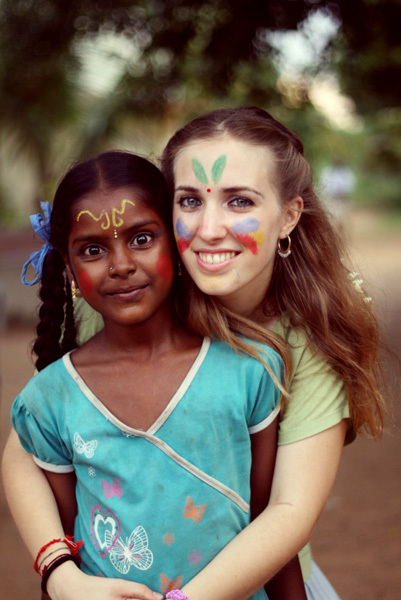 Last summer, I did a long-term volunteering in India, first joining a work camp and later I stayed alone. Work at the field was very positive and I enjoyed the chance of sharing experiences with other volunteers. When you live profound and intense experiences, I find that being able to share impressions and feelings with other people who experienced the same, may be often necessary. Precisely this is what I missed at the beginning of my solo experience. However, most of the people I was in touch with (especially teachers and students from Laia Foundation) welcomed me as part of their family and had the opportunity to experience the real Indian culture. Of all the projects that I was involved during my stay, I especially liked organizing activities for the after-school support centres.It is motivating to notice that children make improvements in a few sessions. Another aspect is the joy with which children welcome volunteers when arriving at the centre. Since I arrived here I could see that children in India are very different from those in Western countries: they are always smiling and one can feel their happiness when you are with them. I also learnt many things I did not expect. First, that life can be so different from what I was used to: the rhythm of life, people’s priorities, etc. When you come to India you have to adjust yourself and learn to live slowly, intensely and appreciating the little details, like a good food or the smell of jasmine flowers that women wear in their hair. I would recommend to everyone this experience.